NFL and NCAA game picks and locks of the week using PFF's exclusive player and team data. Our 4-1 Week 16 was the third-best of the season, with the Chargers debacle on Saturday night the only black mark of the week. Week 17 doesn’t offer as much in terms of opportunities, with (by our count) five games that have no meaning whatsoever with respect to the playoff picture. That said, we still like some games, which we’ve printed below. Our models rely heavily on our PFFELO rating system for the NFL, along with game information like where the game is played, how far a team has to travel, etc. We also fold in opponent-adjusted PFF grades into our machine learning algorithm to factor in roster changes and possible asymmetric mismatches that can occur through the course of a game. With the Packers (-3) hitting (LOL), as well as the Giants UNDER 7 and Jets OVER 6 resolutions, we’re 22-18-1 on our “Lock of the Week” picks since the start of 2017 (55.0%). 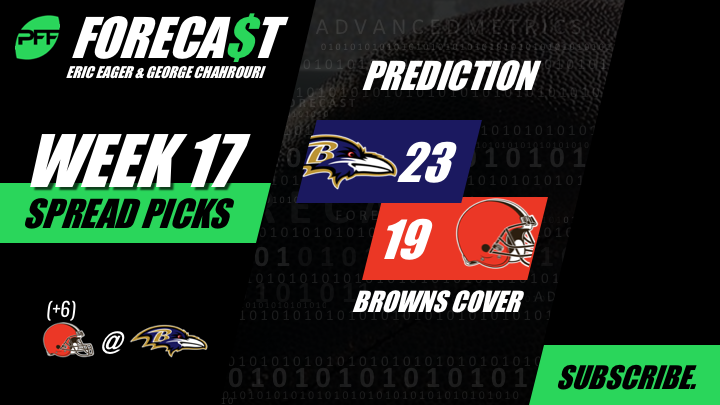 The analyses below will involve a point-counterpoint between the two of us for both picks, using perspectives that only the PFF grades and data can provide. Follow us on Twitter at @PFF_Eric and @PFF_George, and for some podcast commentary on some of these picks, and the process that goes into them, give the PFF Forecast a listen. We will have a special Monday morning podcast each week with look ahead lines for the upcoming week. Point (Eric Eager): This is a classic “fade overreaction” spot, with the inspired way the Bills have played the last month certainly built into this number (as is the predicted home egg laid by the Dolphins in Week 16 against the Jaguars). The problem with backing Buffalo in this spot is that their identity is Josh Allen taking off with the football on designed passing plays and running the ball conventionally on designed running plays. With the former, they have been one of the league’s worst teams on early downs, and it’s relatively easy for an NFL team to take away the former if they know it’s coming (and Miami does, having surrendered 126 yards to Allen on scrambles alone in a game we pushed about a month ago). 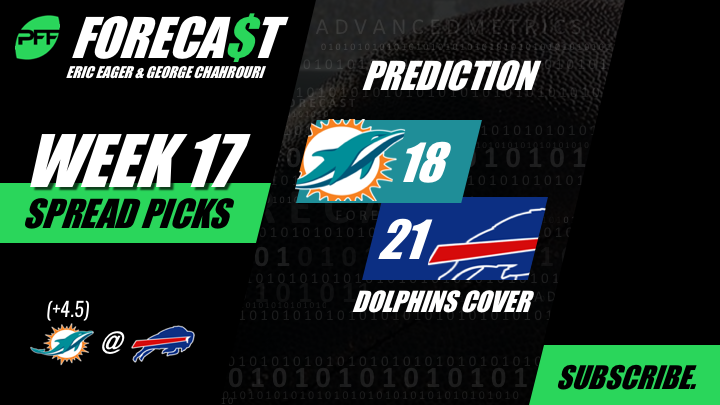 Without the receivers to take advantage of the loss of Xavien Howard on the outside, look for the Bills to every bit play the part of the home team in a game lined with an over/under of 39.5, making covering over a field goal for the young squad very unlikely. Counterpoint (George Chahrouri): Eric likes to fade the overreaction, but he seems to be forgetting that taking the worse quarterback on the road is not often a recipe for success. Josh Allen has not been great by any stretch of the imagination, but he hasn’t been close to the atrocity that is Ryan Tannehill’s “one step forward, two steps back” campaign. Only Josh Rosen and the Cardinals are generating a more negative EPA per dropback than Tannehill and the Dolphins. Tannehill has a respectable passer rating (99.0) but only 41.0 percent of his touchdown throws are a result of a throw that is completed at below the league average rate, in other words, those touchdowns are nothing to be excited about. Meanwhile, he hasn’t had a single unlucky interception (a throw that earns a turnover-worthy grade but isn’t intercepted), only one other quarterback has been that lucky (Manning, Eli), and he owns the highest rate of turnover-worthy plays this season. I’ll take the generational runner in Buffalo any day of the week. The Falcons opened the week as 1.5 point underdogs and are now favored by a point, proof that I am not the only lover of the dirty bird. The Falcons are a top-10 offense overall and on early downs, and Tampa is allowing a 119.2 passer rating when a wide receiver is the target on a passing play (31st), so Julio Jones should be about a covered as the local workers in Tampa’s only worthwhile industry. The Falcons know exactly how to prime us up for failure in 2019. Mark it down, I will be hot and bothered and ready to drive the bandwagon next season. Counterpoint (EE): Festivus was a few days ago, and as such, I aired a few grievances at the feet of our PFFalcons. We are 1-4 picking their games this season in stark contrast to our success backing and fading them in numerous spots last year. While I very much like Atlanta in this spot, there are things that scare me. For example, Jameis Winston’s goods have been very good this season, where he’s generating positively-graded throws at a rate higher than any other starting quarterback in the league so far. He, along with the ample weapons Tampa Bay has at their disposal, should be able to sufficiently stress a Falcons defense that is missing a number of key contributors to a secondary that was good in 2017. If you decide to hold your nose (again) in 2018, God bless ya. Point (GC): If you’re going to take a running back in the first round you better at least make sure he’s a quarterback. Since week 11, the Ravens are running the heck out of the ball to the tune of the fourth-best rushing attack by EPA per run play, behind only the Titans, Panthers, and Rams. All that running has translated into the 17th-best overall offense and a massive 11 offensive touchdowns (t-25th with the Spreadskins and the Jets). On the flip side, Cleveland has the fifth-best offense since the abolition of the plague after Week 8. Baker Mayfield leads the NFL in yards per pass attempt since that time and coincidentally has gone from 24th to second in percentage of dropbacks resulting in a throw to an open receiver (step or more of separation). A huge bump in early down efficiency and the screen game has the Browns facing 3rd and long at the second-lowest rate since Week 9, which should help temper the excitement of everyone watching the Ravens’ defense fill holes at a breakneck pace. The Browns cover and solidify a Gregg Williams’ reign of terror in the city of Rock and Roll. Counterpoint (EE): You guys know the two things I like backing the most are a solid defense and a running game. Generational talent Gus Edwards and his first-round pedigree (399 yards after contact, 20 missed tackles forced on the ground) has been a big get for the Ravens’ offense after flavor-of-the-week back Alex Collins didn’t pan out early in the season. Baltimore’s defense (while the beneficiary of a bunch of Chargers unforced errors last Saturday) has been among the league’s best, holding opponents to an NFL best 45% success on early-down passes. Lamar Jackson has made just enough throws to keep some bad defenses (and the Chargers) honest the last six weeks, bringing everything together for the birds despite an offense that still is a bottom half of the league unit in terms of EPA per play during the Jackson era. Can the streak continue with the AFC North division title just one home win away? We’ll see.